Ned Rozell | Geophysical Institute Jul 21, 2014. Sean Brennan at work on the Nushagak River. Strontium is a trace element and mineral people use to make glow-in-the-dark paints and toothpaste for sensitive teeth. 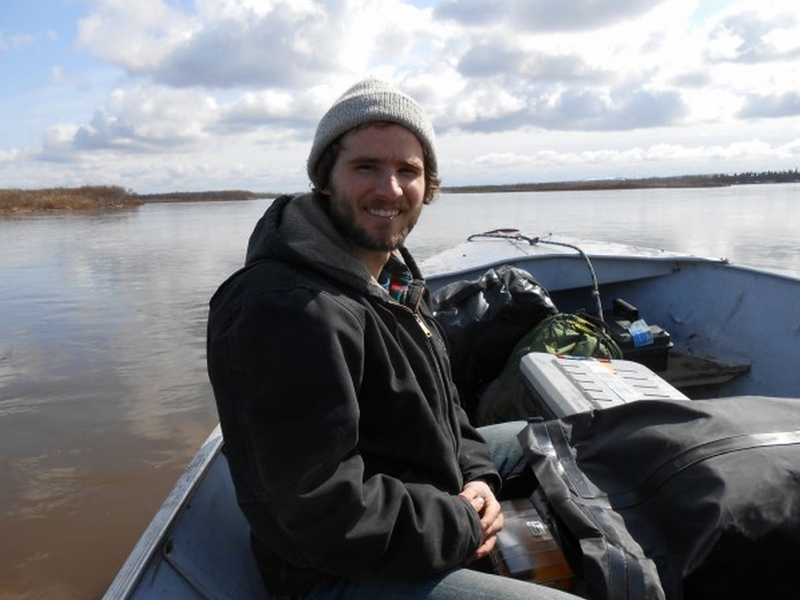 In research for his college degree, Sean Brennan used strontium’s unique qualities to track salmon in an Alaska river. At Brennan’s Ph.D. defense at the University of Alaska Fairbanks, advisor Matthew Wooller praised Brennan’s ambitious plan and his execution of it up and down the many webs of the Nushagak River. The Nushagak, a river swelling with the bodies of salmon right now, drains the Nushagak Hills as well as the Alaska and Aleutian ranges. The Nushagak and all its fingers provide a path for salmon from their natal streams to Bristol Bay. Brennan first had the idea of tracking salmon using strontium during his training in stable isotope ecology at the University of Utah. He was impressed people were able to break substances down to the atom level in order to follow salmon populations in California. He wondered if he could use stable isotope analysis on the magnificent wild salmon stocks of Alaska. His goal: to create a strontium isotope map of Alaska’s streams that showed the paths of individual salmon heading back to the gravels where they wriggled from egg sacks. In a river like the Nushagak, which receives water from an area larger than Massachusetts, there are a dizzying number of rivers and creeks to which salmon might migrate. A king salmon caught near the river’s mouth might be headed to the Mulchatna, the Stuyahok, the Chilikadrotna, the Chilchitna or the Chichitnok River. Dozens of creeks are also possible origins for Bristol Bay salmon. Brennan chose to study the Nushagak because it produces so many salmon and the unique geology of its tributaries. Different rocks in the upper watersheds give distinct basins their own flavor, absorbed by salmon on their way to the ocean. Brennan started his research by “cold-calling” numbers he found in the phone book for the university’s Bristol Bay campus in Dillingham. He connected with people like Peter Christopher, Sr. of New Stuyahok, a village on the Nushagak River. Christopher met Brennan on the Nushagak. In his riverboat, Christopher shared memories of river bends and sloughs and helped Brennan collect water samples and trap slimy sculpin, juvenile king and silver salmon and scavenge carcasses of spawned out adult kings. Brennan wanted slimy sculpin for a few reasons: the fish live their entire lives in a few hundred feet of river — they offer a good test to see if his strontium isotope method worked. The part of the slimy sculpin (as well as the salmon) that holds this information is the otolith, a chip-like bone in a fish’s head that grows a new layer each year. By slicing the otolith and measuring the ratio of two different types of strontium, Brennan found the method matched slimy sculpin and juvenile kings to the known stretch of water in which they lived. He then tested 250 king salmon caught in Nushagak Bay. In nine out of 10 salmon he was able to trace the fish to one of seven “strontium isotopic groups,” distinct regions in the upper Nushagak drainage. Using genetics and other methods, scientists and managers are able to track fish caught in Bristol Bay to the major watershed in which they were born, like the Nushagak, Kvichak or other great rivers. Brennan’s results suggest that in certain areas fish can be tracked to sub-basins within these rivers and sometimes to even to small tributaries. “It’s a different tool you can use,” he said. Flush with these encouraging results, Brennan has accepted a post-doctoral position with the University of Washington. This summer, in addition to moving from Fairbanks to Seattle, he’s back working on the Nushagak, where he is further refining his system. “It’ll be cool to see how it develops,” he said.